For many in Loveland, Colorado, the ancient Japanese craft of origami is more than just a hobby—it’s a true art form. 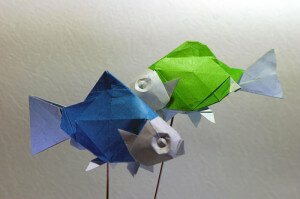 Have you ever considered trying your hand at origami? Do you live in Loveland or Larimer County? If so, I highly recommend exploring the art by learning the basics with a true expert in the craft. Join Loveland Loves Origami, a public class that meets on the first Saturday of each month at the Loveland Public Library’s Erion Room, located on the second floor. Origami, or paper folding, is an entertaining, educational, and fun activity that beginners and experts can all enjoy. This Loveland group can help you understand origami instructions, get ideas for classroom activities if you’re a local teacher, all while helping you to enjoy learning and sharing with others. A retired schoolteacher, Janet Dean, who used origami in her classroom to engage students in an art that builds concentration, precision, and creativity, teaches Loveland Loves Origami. Janet is also a member of Origami USA. Beginners and experts are welcome, and children ages 8 and up are encouraged to attend with an adult. No registration or fee is required for the event. For more information on the event, contact Bobbi at 962-2401, or email her at bobbi.benesh@cityofloveland.org. If you are looking for a creative outlet, have always been intrigued by the beauty and sophistication of origami, or just want a taste of the craft, I encourage you to head over to the Loveland Public Library. The next class is Oct. 5 from11 a.m. to 1 p.m.
From all of us at The Law Office of Chris D. Hefty, happy folding!